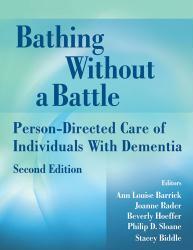 An individualized, problem-solving approach to bathing and personal care of individuals with dementia. On the basis of extensive original research and clinical experience, the editors have developed strategies and techniques that work in both institution and home settings. Their approach is also appropriate for caregiving activities other than bathing, such as morning and evening care, and for frail elders not suffering from dementia.